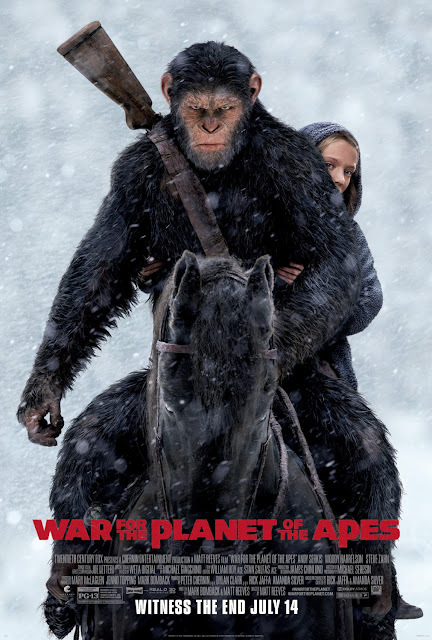 Chrichton's World: Review War for the Planet of the Apes (2017): A beautiful and fitting end to the trilogy. And very underrated! Review War for the Planet of the Apes (2017): A beautiful and fitting end to the trilogy. And very underrated! For some reason this last part in the franchise didn't connect with some people as much as it did with me. They were disappointed and outraged by the lack of war and action. I even read a comment from a guy who was expecting Lord of the Rings battles with apes. To a degree I understand that complaint since over and over again this was hinted and implied. But after Dawn of the Planet of the Apes it was clear to me that Caesar (Andy Serkis) is a more pragmatic, practical and peaceful leader. All he wanted was to have a place for himself and the other apes so that they could live in peace preferably in harmony with the humans. If they would allow it. But when attacked he would do what he could to protect his comrades. Caesar never wanted to dominate the world. But like any living conscious being he wanted to be free. If he truly wanted to harm people he could and would have done that already. The path he chose however was met with heavy resistance since humans weren't ready for the new age of evolution and some apes themselves couldn't let go of the atrocities done to them by humans. Caesar also loses himself a little when a tragic event occurs to him. Outraged and consumed with hate. Until he comes to a realization that it won't lead to anything constructive. If it wasn't clear surely by now it's apparent that Planet of the Apes is an allegory for human behaviour. So much of what happens in these films can be applied to real and historic events. Take Woody Harrelson's character The Colonel. He seems to be the epitome of evil until you learn there is more to him and his actions. There is reason to his madness. It helps you understand where people like him come from. In the world of today a lot of political and religious groups are seen as agressors but are they really? If you focus on their actions then there is no doubt. But have you ever wondered why they do what they do? Usually they react to evil deeds and actions done to them by another political and religious group. These issues aren't as clear cut made out to be. War for the Planet of the Apes demonstrates this in ways that were very emotional and appealing. Very basic even. It is so easy to give into hate and anger. But to forgive and be merciful is much harder and in the end the much better solution. This film has a lot of heart and wasn't afraid us to show some of the horrors that occur in war. Granted most of it is psychophysical but isn't that the worst kind? Even if you don't care for the deeper issues and allegories there is more than enough story and spectacle to keep you satisfied. While this film might not contain non stop action or big battles every action sequence matters since you are made to care about the characters. You will root for the apes since they obviously are the good ones in this story and you will cheer when the evil humans get what they deserve. While not many there are still some kind and good humans left who look beyond species and judge on actions alone. The apes in this film look phenomenal. They look and act so real that you will often wonder whether they used real apes or not. The majority of these apes will emote to you in ways you can't imagine. That is if you are human. Because honestly if the acting done by the voice actors who also did the motion capture doesn't get to you then very likely there is something wrong with you. Overall the film is incredibly beautiful and touching. If you want to, it gives you a lot of food for thought, but if not, there is enough going on to make you root for Caesar and his comrades. A very fitting end.